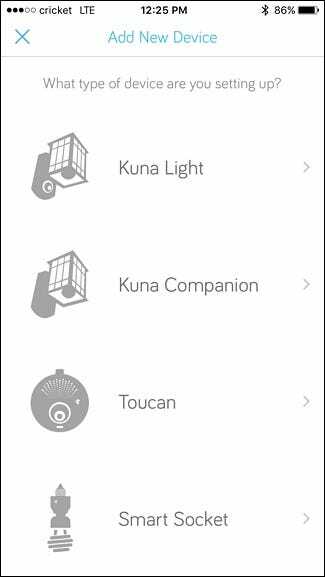 The Kuna Home Security Camera is a porch light fixture that installs and works just like any other porch light, but with a security camera built-in. 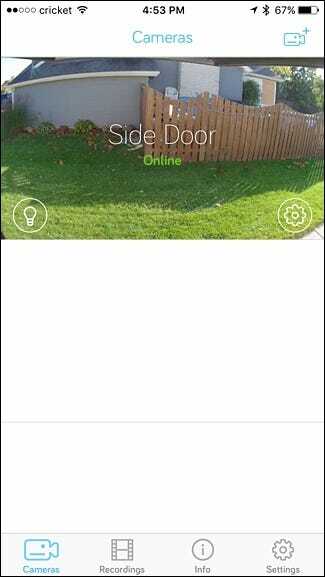 The camera is motion-activated, so you can be alerted of any activity going on outside your house. Here’s how to install it and set it up. If you’ve replaced light fixtures before, then installing the Kuna will be familiar territory for you, since there’s no extra wiring that you need to mess with. The camera gets its power from the light fixture’s wiring, and it connects to your network over Wi-Fi. However, even if you’ve never installed a light fixture before, it’s actually not too difficult and only consists of three wires that are color coded to make it easy for anyone to wire it up. To start, I want to reiterate: In order to install the Kuna, you need an existing porch light wired into your wall. The Kuna is not a standalone battery-powered product like the Ring–it needs to hook up to existing porch light wiring to work. 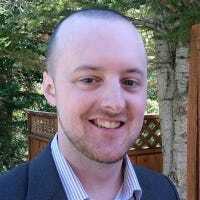 So if you don’t have that, this will be a much longer process and you’ll probably need to contact a professional. Assuming you’re replacing an existing porch light, though, you’ll only need a few tools to do the job. The absolute must-have tool is a Phillips-head screwdriver (also a flat-head screwdriver if you’re dealing with slotted screws on the old light fixture). This one tool can do the whole job for you, but some optional (and very handy) tools include a wire stripper (in case you need to cut wire or strip off wire housings), a voltage tester, and a power drill, which is easier than using a screwdriver in some cases. Also keep in mind that the Kuna requires a junction box to be installed onto. That’s because the Kuna uses a mounting plate that must first be screwed onto the junction box, and then the Kuna screws onto the mounting plate. Plus, you’ll need room to stick all of the wires into. There will likely already be a junction box in place, but if not, you’ll need to make some modifications. Technically, you could just flip the switch off that controls the light fixture that you’ll be replacing. This will kill all power running to the light fixture. However, once someone flips the switch on, power will instantly travel to those wires and you could get electrocuted. So if you want to be absolutely safe, you’ll want to turn the power off at the breaker box by flipping the corresponding breaker that controls the light fixture. You may have to go through some trial and error before you figure out which breaker corresponds to your porch light. Once your light switch no longer turns the light on, you know you’ve flipped the correct breaker. The first thing you’ll want to do is remove the existing light fixture. There will be two to four screws that hold the light fixture to the exterior wall, that you’ll remove with a screwdriver or a power drill. Carefully pull out the old light fixture since it will still be connected to the wall’s wiring. There will be a black wire, white wire, and sometimes a bare copper wire. The black wire is the power wire, the white wire is the return wire, and the bare copper wire is the ground wire. If there’s no ground wire, then it’s not a huge deal, but try to connect a ground wire if you can (sometimes the ground wire is buried in the back of the junction box sitting unused). The wires coming out from the wall and the wires connected to the light fixture will be connected to one another with wire nuts. All you have to do is twist the nuts counter-clockwise to disconnect them. Once you have all three wire nuts taken off, you can gently remove the light fixture completely. There also might be a mounting plate attached to the junction box that you’ll need to remove as well, since we’ll be using a different mounting plate. Once the old light fixture is completely gone, you can now begin the installation process for the Kuna. However, depending on what your exterior wall is made of, you may have to do some modifications before you can actually install the new light fixture. For instance, if you’re installing the fixture over siding, you might want to take some shears and cut out a portion of the siding so that the Kuna light can fit flush with the exterior sheathing (a.k.a. the wall underneath the siding). You don’t have to do this, but the light fixture may not sit flush with the exterior wall and you’ll likely need to do some caulking to fill in the gaps. The first thing you’ll need to do is install the mounting plate, which uses two included screws that go in on either side. It doesn’t matter if you mount it horizontally or vertically, but the two other screws sticking out need to be horizontal with each other. Once the mounting plate is up, you can start installing the light fixture itself. Either have a friend hold up the light fixture for you while you wire it up, or hold up against the wall using your chest so that you have your hands free. The Kuna comes with a convenient hook that lets you hang the light fixture from the mounting plate, but it ended up hanging too far down for the wires to reach each other on my wall. To wire it up, simply match the wall’s black wires to the Kuna’s black wires, the wall’s white wires to the Kuna’s white wires, and the wall’s ground wire (if there is one) to the Kuna’s ground wire. Use the included wire nuts to fasten eat set of two wires together. Do this by placing the two wires together side-by-side with the ends matching, then screwing the wire nut on like you’re turning a small knob. Stop when there’s an increase in resistance and you can’t turn it anymore. Once you have the wires connected, you’ll need to shove all of the wiring into the junction box. This shouldn’t be too hard, but you’ll definitely need to be forceful and push the wires back into the box, so don’t be afraid to get rough with it. As you go to mount the Kuna light fixture over the mounting plate, those two screws sticking out will go through the two corresponding holes on the light fixture. Once you have the Kuna placed on the wall, those two screws will stick through. You’ll then take the two black screw nuts included with the Kuna and screw them onto the mounting screws, which will secure the light fixture into place. The screws don’t stick out very far, so the nuts might not screw on all the way, but get them as tight as possible. Once that’s done, the Kuna is ready to go and you can turn the power back on. Make sure to flip on the light switch and leave it on, since the light fixture will need constant power to stay connected to your Wi-Fi network. 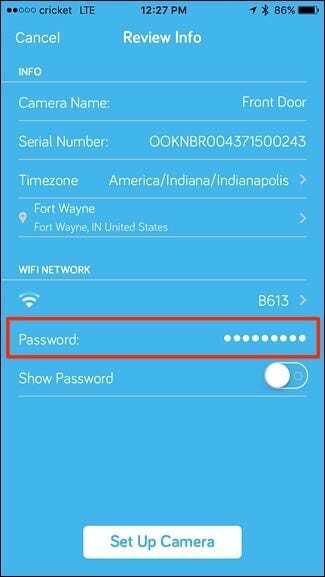 The last step is to set up the Kuna on the software end and connect it to your home’s Wi-Fi network so that you can see the live view of the camera right on your smartphone. 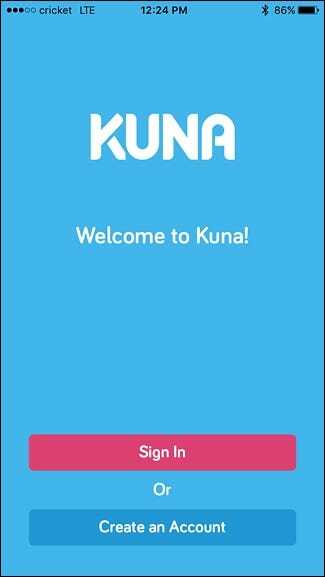 To start, download the Kuna app (iOS and Android) and open it up. Tap on “Create an Account” if you don’t already have one. 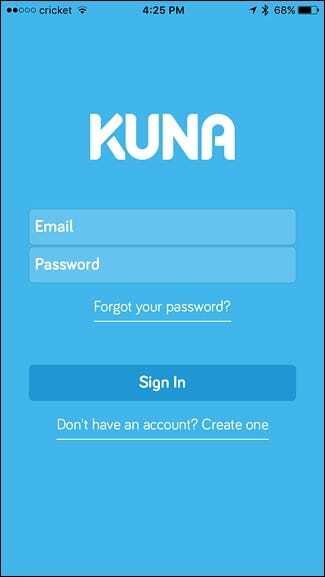 Enter your email address and create a password for your Kuna account. 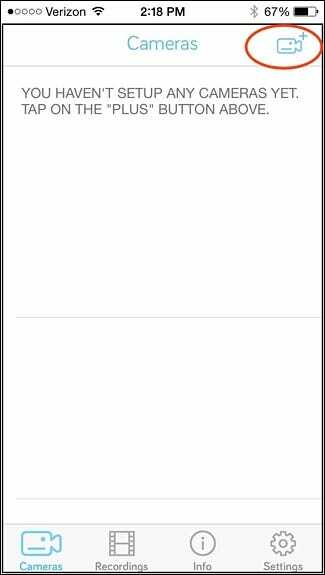 Then hit “Sign Up”. Once your account has been created, you’ll need to click the link in the confirmation email that you’ll receive and sign into your account in the app. Next, tap on the camera icon in the top-right corner with the plus sign. 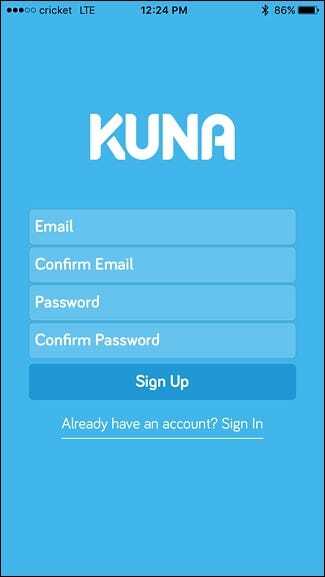 On the next screen, select the type of Kuna product that you have. In this case, we’ll select “Kuna Light”. Your Kuna light should appear in the list. If not, move closer to it since the setup process uses Bluetooth (also make sure Bluetooth is turned on for your phone if it isn’t already). Once it appears, tap on it to select it. 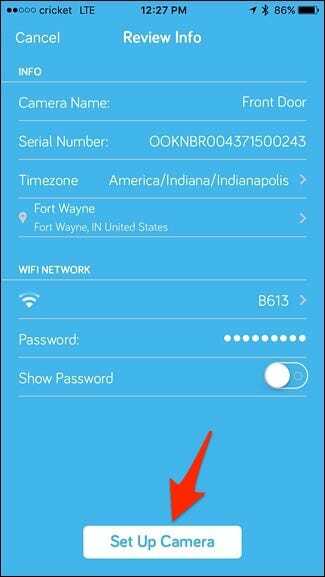 The next screen will consist of some finer details, like location and your Wi-Fi network. 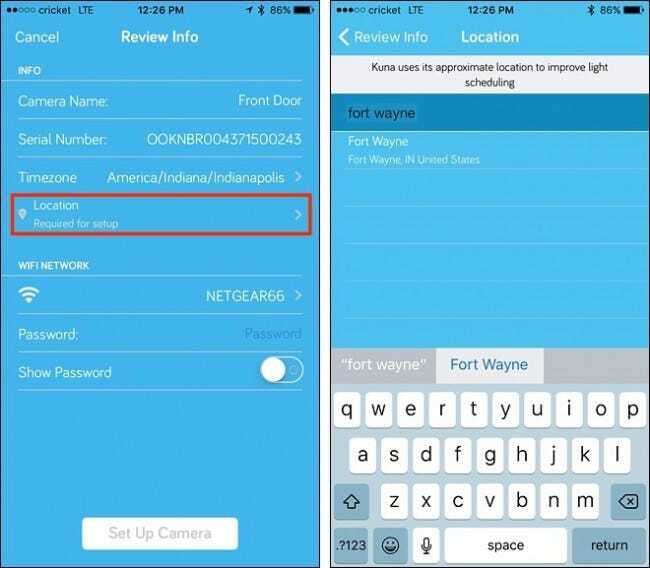 Start by tapping on “Location” and enter in your city or town. 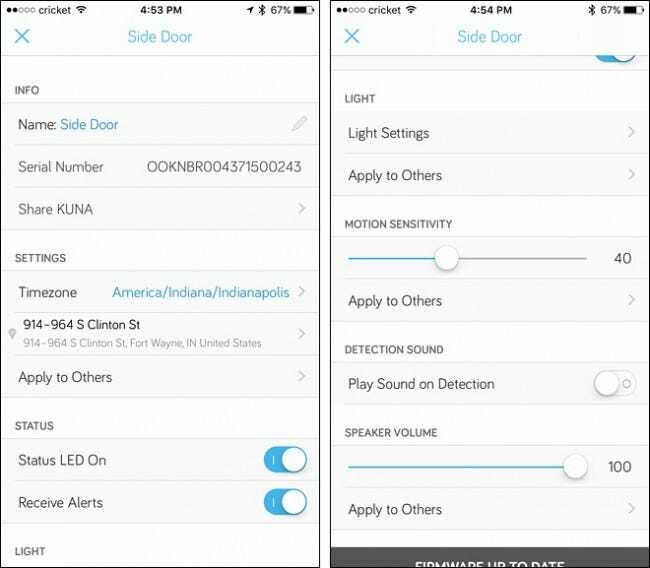 You don’t have to provide your address, and this feature makes dawn/dusk scheduling work better than the built-in light sensor. After that, tap on the Wi-Fi network. 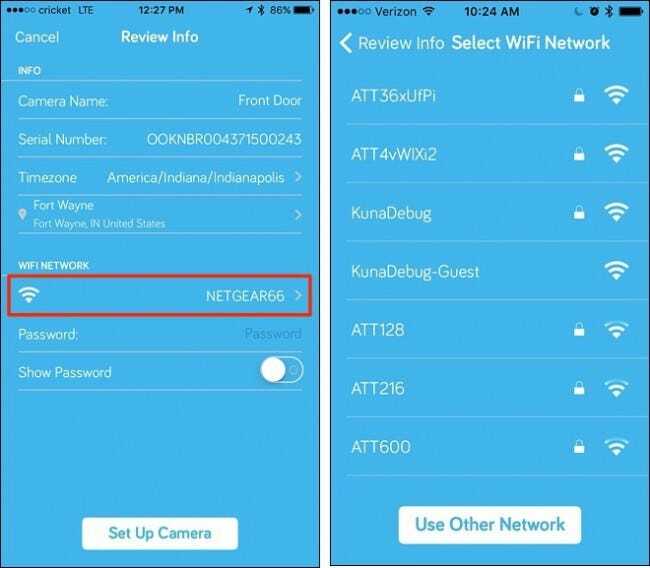 The Kuna may automatically select strongest Wi-Fi network that it detects, but if it’s the wrong one, select your actual Wi-Fi network from the list. Next, enter in the password for your Wi-Fi. After that, tap on “Set Up Camera” at the bottom. 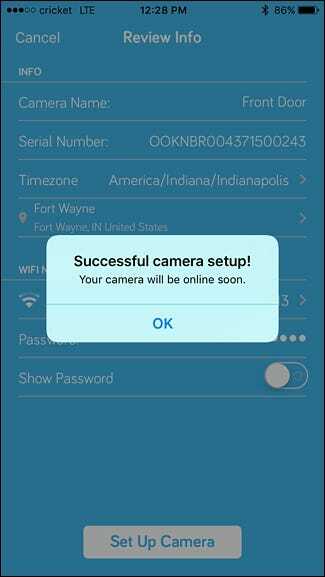 The setup can take a few minutes, but after it’s complete, you’ll get a pop-up saying that the camera is all set up and ready to go. You’ll be taken to the main screen where your Kuna camera will be visible. If you have multiple Kuna cameras, they’ll appear on this screen. 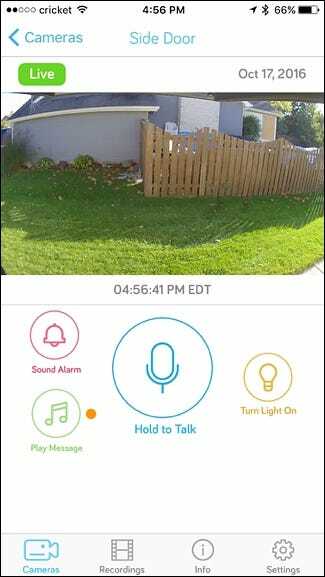 Tapping on the camera will bring up the live view and allows you to do a handful of things, like push-to-talk, sound an alarm, turn on the porch light, and play a pre-recorded message. 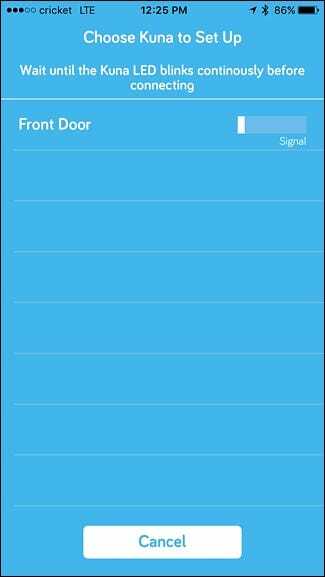 From the main screen, you can also tap on the settings gear icon on the camera picture to get access to different settings and features for that camera, like motion sensitivity, light settings, alert settings, renaming the Kuna, and more.